(Photo Courtesy/Robert Worth) Kristina Seguin's car was engulfed in flames on Wednesday. Alpena, Mich. — A car on fire and a woman’s quick instincts, that’s what unfolded Wednesday near the corner of First Ave. and Hitchcock St. in the city. Kristina Seguin’s 2008 Pontiac G6 went up in flames while she was visiting a friend. Firefighters put out the blaze in minutes, but before they arrived, Seguin had to run to her burning car and save something very near and dear to her heart. That action saved her five-year-old dog Macy’s life. 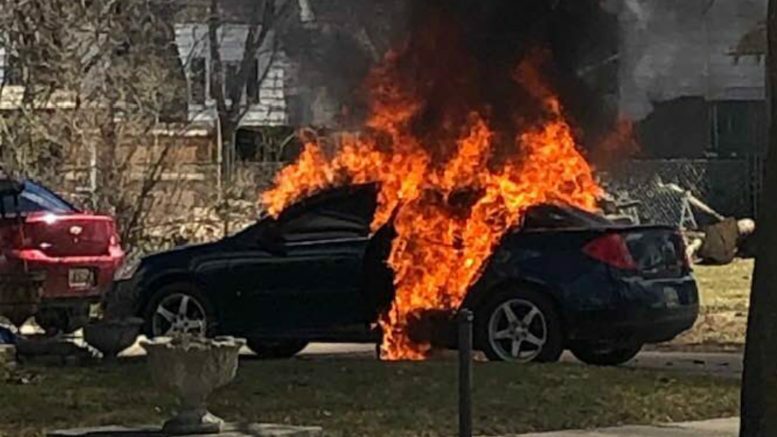 She left her window open before she went inside, but the dog refused to jump out, and instead, hid on the passenger side as the flames started to grow. Seguin or her friend didn’t smell smoke or had any indication of what was going on until the man came up to the door. The car was turned off at the time. Seguin and firefighters don’t know what caused the fire. Seguin is just happy to have her dog alive and well. Macy underwent some oxygen treatment after the experience. She was not burned. Her coat did suffer some damage, but she is doing okay at this time.